If you’re looking to save a bit of money, and you don’t mind making some hefty repairs, distressed properties may be your answer. 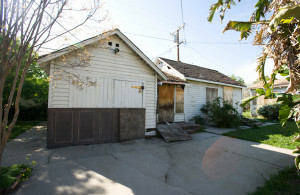 Distressed properties are homes whose owners cannot maintain them. Either these properties suffer from neglect and are in poor condition, or they are at risk of foreclosure due to non-payment of mortgage and/or taxes. And if you’re willing to do the legwork—and handle the repairs—these homes are often sold at below-market rates, but you’ll have to find them first. Once you spot a potential property, make a note of the address to save yourself time later. After you have canvassed the neighborhood and identified homes that seem distressed, send letters to the owners of the homes. Your local tax assessor’s office will have the name and address of the property owner. You can also ask a REALTOR® to locate and contact the owner on your behalf. Some homeowners will ignore you, but others might jump at the chance to sell to an interested buyer before entering into foreclosure. Using a REALTOR® can cut down on a lot of the research and contacting legwork. If you see a distressed property for sale, try contacting a REALTOR® directly and ask them why the owner is selling. If the owner is struggling or the home is need of repairs, it’s likely a distressed property. This also gives you a chance to start a relationship with a REALTOR®. Decide which price levels and neighborhoods you are targeting, and ask an agent to contact you about distressed properties meeting your criteria. Many sites charge a fee to browse their database. Since you’ll have to pay upfront, you won’t know if the cost was worth it until you’ve already paid. Not all sites guarantee their information. What you’re looking at online may not be what you see in person. Some listings are outdated. You may waste time by looking at already-sold homes. If you’re browsing online, be sure to stick with a reputable free site. Try browsing realtor.com®’s Homes for Sale to get an idea of what is available in your area.